Wall hung gas boilers in our living spaces deliver heat and home comfort. 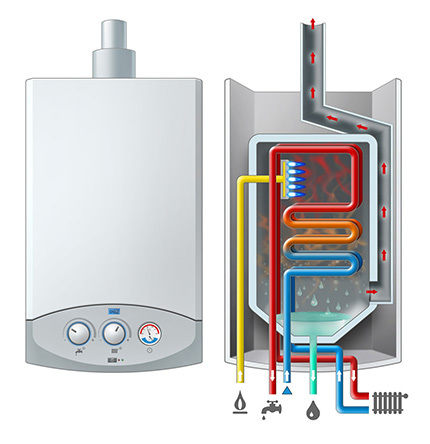 These can be condensing boilers or combi-boilers: we can provide the right pressure and temperature measuring instruments for either of these options. Our portfolio includes measuring instruments for monitoring and controlling hot water and industrial water circuits. Although mechanical pressure switches are used to perform the pressure-dependent opening and closing of circuits, a current-independent on-site display and an electronic output signal can both be implemented with mechatronic pressure gauges. Depending on your needs, you can choose from various different output signals. You create a pressure display independent of measuring points by using a pressure measuring instrument with capillaries. Specifically for applications calling for frequent bending of capillaries, we offer the alternative to the familiar copper capillaries of ultra-flexible plastic capillaries. To measure the temperature of hot water or industrial water, expansion thermometers or thermo pressure gauges can be used - we offer that choice.